Welcome to The Redbury, an acclaimed brand in the award-winning sbe Hotel Collection. Curated by visionary Creative Director and renowned photographer Matthew Rolston in collaboration with sbe Founder and CEO Sam Nazarian, The Redbury has locations in some of the world’s most iconic and glamorous neighborhoods. The Redbury Hollywood is situated at the historic convergence of Hollywood and Vine, The Redbury South Beach stands at the heart of Art Deco chic on Collins and 18th and the Redbury New York is located in Manhattan’s burgeoning NoMad district. Offering spacious guest accommodations as well as uncompromising amenities and services, The Redbury provides an unpretentious and engaging hospitality experience, appealing to communities that are passionately connected to the arts, music, fashion and entertainment. Complementing the livability of each location is our award-winning, signature restaurant Cleo, as well as lush outdoor spaces and warm, welcoming bars. Elevating your stay at The Redbury is VIP access to the sbe Hospitality Collection – providing exclusive entry into sbe’s celebrated hotel, dining and nightlife destinations throughout Hollywood, greater Los Angeles, New York and Miami. The Redbury’s thoughtfully-appointed guest rooms exude a warm, bohemian counter-culture feel with design elements drawn from a variety of old-world cultures. Each spacious room offers a home-like atmosphere that can accommodate stays of a day, a week or as long as needed. sbe is a leading lifestyle hospitality company that develops, manages and operates award-winning hotels, restaurants and night clubs. Through exclusive partnerships with cultural visionaries, sbe is dedicated to delivering the best in service, design, culinary programming, and entertainment. Already a proven leader in the hospitality and real estate industries, sbe has more than 100 properties currently operating or in development, and has expanded several of its flagship brands including SLS Hotels, Katsuya, The Bazaar by José Andrés, Hyde Lounge and The Redbury, nationally and internationally. The company will debut a new slates of hotel & residence properties in 2016, including the recently announced Hyde Hotel & Residences and SLS LUX Hotel & Residences. Founded in 2002 by Chairman and CEO Sam Nazarian, sbe is a privately held company. More information about sbe can be obtained at sbe.com. With an uncompromising entrepreneurial instinct and personal style, sbe Founder, Chairman and CEO Sam Nazarian has been a transformative force in revolutionizing contemporary hospitality. In only a decade, Nazarian has defined “the scene” in Los Angeles and beyond, driving sbe to become the creative wellspring for some of the world’s most sought-after luxury lifestyle brands in North America, including SLS Hotels, The Bazaar by José Andrés and Hyde Lounge. Nazarian’s career began in the tech industry with a wireless company he co-founded and later sold after leading its rapid growth and record sales. 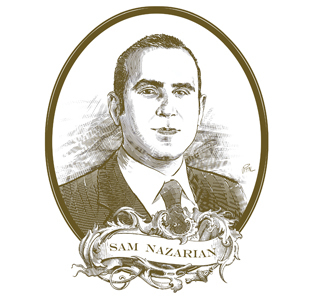 In 2001, Nazarian began to hone his expertise in development and hospitality by successfully diversifying his family’s assets into real estate holdings across virtually all sectors of the market. It was during this phase of his career that Nazarian began to see a demand for a different approach to hospitality—one that would fundamentally change the industry moving forward. From the launch of sbe’s first nightclub in 2003, Nazarian has evolved the privately-held sbe into the definitive name in luxury with a collection that includes some of the most exclusive and high-profile hospitality and lifestyle destinations in the world. To create sbe’s award-winning portfolio, Nazarian has aligned with internationally acclaimed design and culinary talents such as Philippe Starck and Matthew Rolston and chefs José Andrés and Daniel Elmaleh. Nazarian’s business savvy and creative vision have also attracted the interest of Wall Street, as well as active participation from a “who’s who” of financial institutions, including Merrill Lynch, JP Morgan, Credit Suisse, Lowe Enterprises, Colony Capital and Stockbridge Real Estate Funds. The youngest executive to be named one of the “Top 100 Most Powerful People in Southern California” by West, the Los Angeles Times’ magazine, Nazarian was also named among “The Influentials” in Los Angeles Magazine and was recently honored with the Mondavi Wine & Food award. He is an active member of the Southern California Institute of Architecture’s Board of Directors and a generous supporter of the Beverly Hills Education Foundation. In July 2009, Los Angeles Mayor Antonio Villaraigosa appointed Nazarian to the Board of Airport Commissioners of Los Angeles World Airports. Nazarian studied at New York University and the University of Southern California and currently divides his time between residences in Los Angeles, Las Vegas, New York and Miami. Internationally acclaimed visual auteur Matthew Rolston has consistently redefined how people see pop culture, photography and modern beauty. Renowned for his influential lighting techniques and unique approach to art direction and design, Rolston’s career is synonymous with the revival and expression of Hollywood Glamour. Rolston’s photography has graced 100 Rolling Stone covers and over the years has been featured in other prominent publications, such as Harper’s Bazaar, Vogue, Vanity Fair, W, GQ, Esquire, O, the Oprah Magazine and The New York Times Magazine. Deciding to extend his vision beyond still photography into the moving image, Rolston began conceiving, writing and directing music videos and television commercials for such diverse clients as Madonna, Janet Jackson, Christina Aguilera, Beyoncé Knowles, L’Oreal, Revlon, Esteé Lauder, Clairol, Pantene, Elizabeth Arden, Gap, and Polo Ralph Lauren, among many others. A restlessly creative type, Rolston has once again redefined and expanded the scope of his vision with his latest move into the area of experiential design, including hospitality product design, and entertainment. His first hospitality endeavor, The Redbury, has become Rolston’s fresh canvas, empowering him to showcase a unique, real-world environment for a style-focused audience. For more on Matthew Rolston, please visit www.matthewrolston.com. Preferred Hotels & Resorts℠ is the world’s largest independent hotel brand, representing more than 650 distinctive hotels, resorts, residences, and unique hotel groups across 85 countries. Through its five global collections, Preferred Hotels & Resorts connects discerning travelers to the singular luxury hospitality experience that meets their life and style preferences for each occasion. Every property within the portfolio maintains the high quality standards and unparalleled service levels required by the Preferred Hotels & Resorts Integrated Quality Assurance Program. The iPrefer™ guest loyalty program, Preferred Residences℠, Preferred Family℠, Preferred Pride℠, and Preferred Golf™ offer valuable benefits for travelers seeking a unique experience. For more information, visit PreferredHotels.com.